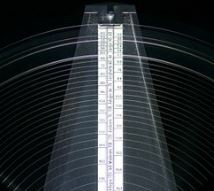 Today we’re also going to discuss a very innovative virtual drumming instrument called Freedrum. It’s a very impressive and ingenious approach to silent playing, as well as playing on the move. We try our best to keep pace with and inform our readers about new trends in the electronic drumming world. In a recent review, we talked about the Aerodrums air drum kit. However, Freedrum is even simpler than Aerodrums and comes with fewer equipment items. So, let’s see how Freedrum works and how drummers can benefit from this virtual percussion instrument. Freedrum is the brainchild of a Swedish inventor August Bering, inspired by his own child’s effort to try to learn how to play drums. 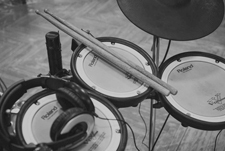 Just like most parents whose kids start playing a musical instrument in a flat, he realized that the noise coming from drumming wasn’t the most convenient sound for their neighbors. That’s when he started developing some ideas that have later evolved into a virtual drumming kit. The entire campaign for funding Freedrum was launched on Kickstarter and he also established a collaboration with the Black Zero tech company. All these efforts have resulted in the instrument we have today. This instrument is based on four strap-on sensors that look like USB-sticks. Two of them are hollow in the middle and these two holes are where you should insert your drumsticks. The other two are attached to two straps. The drummer needs to put them on their feet. The interaction between these sensors creates a virtual drumming set in front of the drummer. You can see what drumming with this kit looks like in this video. Each of these sensors consists of two parts: a circuit board with an integrated gyroscope and a rechargeable battery. The gyroscope is the ‘soul of Freedrum’, since this little device identifies the moves you make while drumming and processes transforms these drum kicks into MIDI-format. After that, you receive these data on the device you’re using through a wireless connection (usually Bluetooth). We’re going to talk about the devices and the belonging software tools later in the text. 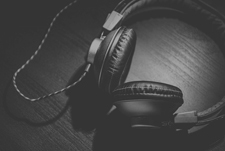 The software solution then sends the sound to your headphones. Also, you can put your drumming on Freedrum through speakers. 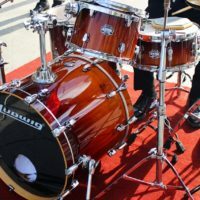 You’ve installed all the technological features required for Freedrum drumming and it’s time to get your party started. 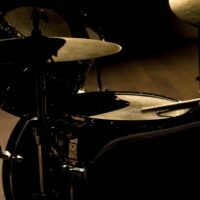 The first question that will come to your mind is whether this drumming experience can reach the real drumming feel that you get when you play a traditional drumming kit. 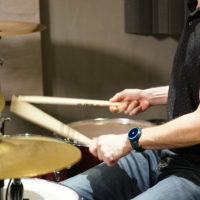 Since the sensors follow the movements and positions of your hand and the sticks, you’ll have all the elements of a regular drumming kit right where you would find them in such a kit. To be more precise, you can play your bass pedal and hi-hat pedal, as well as the ride and crash cymbals the same way you’d play them on a regular drum set. As you sit down, launch the app, turn on the sensors and start playing, you’ll notice after a while that the positions of the elements respond to the ones of a tangible drum kit. What’s more, the Freedrum kit can be adjusted so that it suits left-handed players. Go to your Sensorware app and choose the drumstick sensors. Here you’ll see an option called Left Handed Drumkit. Switch on that function and now Freedrum is set for left-handed drummers. In order to play your Freedrum drumming kit, you need to connect it to a mobile device. Although there were some issues with the Android OS, latency-wise, the good news is that those issues have been resolved. As a result, users of iOS, Android and Windows 10 can play Freedrum via their phones. Still, make sure that you download Android 6 or later versions. It’s less likely that you’ll experience audio lag with these versions. The first thing you should do is download the Freedrum Sensorware app for your OS. After that, switch on the sensors on the drumsticks and foot straps. When sensors are turned on, you need to calibrate them, but don’t worry, it’s not technically demanding. Just put them on a flat surface for a moment and you can start using them. Bear in mind that they come with LiPo batteries which are charged with a dual USB-cable. It takes about one hour to charge the sensor batteries. Once fully charged, they can last up to 13 hours. Another great thing about these sensors is that they have a LED light that shows the battery level and the connection with your mobile device. Now that your sensors are on and you’ve downloaded Sensorware, launch the app and switch on Bluetooth, as well. Choose the option Pair in the app for all the devices in your Freedrum kit. This option will connect your app with the drumsticks and the foot sensors. In case the Freedrum app doesn’t meet your demand, you can use other software solutions. Many drummers opt for GarageBand. It’s a reliable software tool with many practical options. For instance, here you can easily activate the background music option for your rehearsals with Freedrum. In the Advanced section, choose the option Run in background. You can play music from Spotify, Apple Music and other streaming services while practicing your Freedrum. We think Freedrum has massive potential. It doesn’t take large space and you can carry the set around without any difficulties. When it comes to playing comfort, experienced drummers are highly likely to immediately spot the benefits that this drum kit brings. They can be played at home without making any noise that would bother your family members of your neighbors. On the other hand, beginners might need some time to get the right playing feeling. 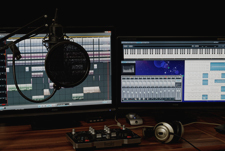 This is why it might be better for them to make their drumming baby steps with one of electronic drum sets. When you get the gist of the rebound feel and the touch of tangible drums, you’ll be ready to try the advantages of Freedrum. As for the sound quality, don’t forget that the Freedrum team are still trying to improve the features of the Android OS – make sure that your version is supported! Freedrum is a great choice for different sorts of drummers, since it isn’t a demanding drumming kit and it can be played anywhere. Also, you can listen to your playing practice both on headphones and on speakers. It could be a great gift choice for drummers or those that have expressed an interest in playing the instrument. Since this instrument is still getting additional features and it’s already a futuristic drumming gem, getting Freedrum is a great leap into the tech-enhanced drumming future.